Last month, Spud turned 6! 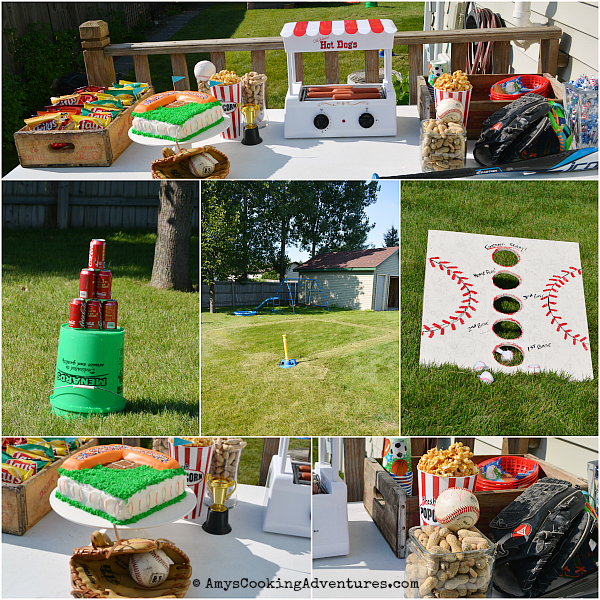 He had just finished up his first summer of t-ball, so he wanted a baseball themed birthday! 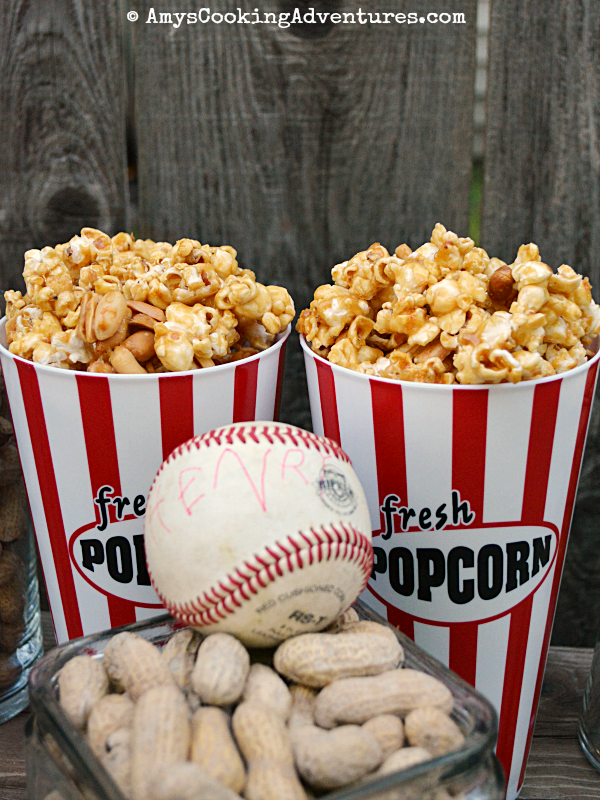 We obviously needed peanuts & cracker jacks, so it was the perfect opportunity to make my own! I tackled Bacon Caramel Corn a couple years ago and the concept is pretty similar, so I was excited to try! 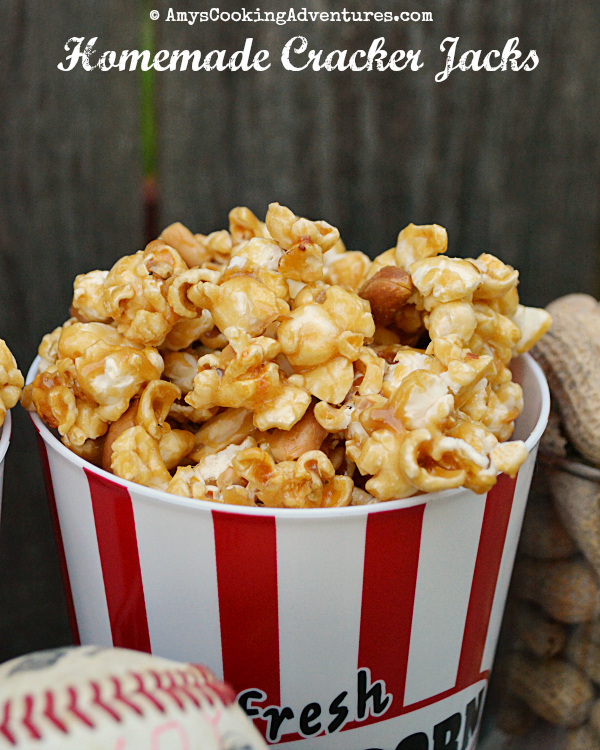 The cracker jacks were the perfect balance of salty and sweet! It was the perfect party for our little slugger! *Use any plain popcorn for this recipe. I used an oil popper, but air poppers or even plain microwave popcorn will work! Preheat oven to 250 degrees F. Line 2 rimmed baking sheets with parchment paper or silicone mats. 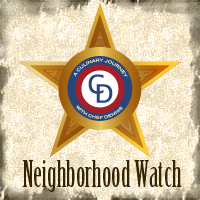 Place the popcorn and peanuts in a stock pot or large heat safe bowl and toss to combine. Place the butter in a medium saucepan over medium heat and melt. Whisk in the brown sugar, corn syrup, water, and salt. Increase heat to medium-high and simmer, stirring frequently until a candy thermometer reaches 250 degrees F.
Remove from heat and stir in the vanilla and baking soda. Immediately pour over the popcorn and stir to mix. Pour the coated popcorn onto the prepared baking sheets, pressing the popcorn into more or less a single layer. Bake in the preheated oven for 1 hour, stirring every 15 minutes. Cool slightly, then break into small chunks. Cool completely and serve. For best results, eat within 3 days. 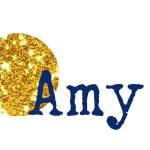 What a great party Amy...Your boys have fantastic parents.